The Somerton Cirque End Table is unusual in a most delightful way. 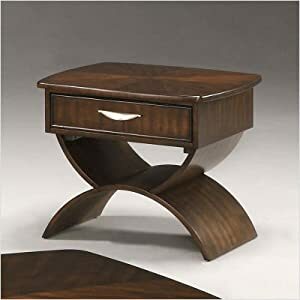 This piece features an arched base, creating wonderful stylistic interplay with the table top, and its single drawer is a most convenient storage spot for any little thing you can think of needing a home.About Somerton Home FurnishingsFor over 20 years, Somerton has meant quality furniture and a quality company. Its warehouses and distribution centers located both in the United States and China provide environmentally friendly manufacturing locations as well as mindful employment spaces. Quality materials such as eco-friendly rubberwood, solid wood, and wood veneers are used to create Somerton pieces ... and any Somerton furnishing you choose will make a welcome, stylish addition to your home.